I thought we’d been told the deficit wasn’t a problem! For the first time ever, U.S. federal tax revenues have topped $1 trillion, and that was only between October and January – the first four months of the fiscal year. You would think that might be contributing to reducing the deficit, but read on and see what it really means. The Monthly Treasury Statement shows that from the beginning of October 2014 through January 2015, the federal government took in $1,046,224,000,000. 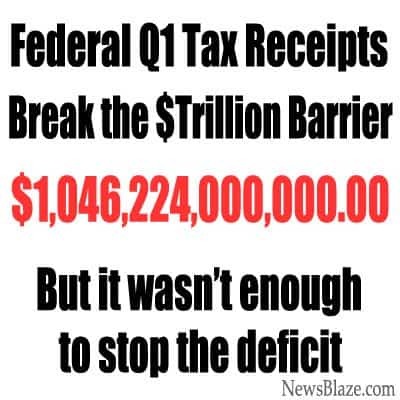 Even so, the government still managed to run a deficit in the first four months of fiscal 2015. That means they are still spending money like there’s no tomorrow. The federal government’s “total receipts,” including revenue from individual income taxes account for nearly half of all receipts, corporate income taxes, social insurance and retirement taxes (chiefly Social Security and Medicare taxes), unemployment insurance taxes, excise taxes, and customs duties. This information is published regularly by the Treasury. Are Trillion Dollar Tax Receipts enough? Looking back 12 months, we see that in the four-month period from October 2013 through January 2014, total receipts were $960 billion. That means an increase of more than $80 billion, not just a record breaker, but a record smasher. In November, receipts were $191 billion, and in December, $335 billion. The government actually ran a surplus of $1.86 billion in December, so we will have to wait and see if that is a trend or an anomaly. As you might expect, the biggest federal agency spender in the last four months of 2014 was Health and Human Services. Their $355 billion spending bill included $113 billion in grants to states for Medicaid. The department’s total outlays for the full fiscal year are projected to top $1 trillion. Following HHS during those four months was the Social Security Administration at $312 billion, followed by the Department of Defense, $195 billion. The smallest amount went to the Department of Commerce, $2.77 billion. Going down the various departments, other outlays included $14.9 billion for the Department of Homeland Security, $57.7 billion for the Department of Veterans Affairs, and $3.3 billion for the Environmental Protection Agency. Peanuts, in comparison to HHS. Incredibly, the interest on Treasury debt securities amounted to $133 billion over the four months. Yet despite the revenue bonanza so far in fiscal 2015, federal outlays over the four months totaled $1,240,433,000,000 so there was a deficit of about $194.2 billion. Wouldn’t you think there might be some outrage in Congress? The Treasury report shows that the federal government had to borrow $203 billion from the public to meet its obligations so far in fiscal 2015, and expects to borrow more than $654 billion over the full fiscal year. Congress is supposed to care about government spending, and there is a lot of spending to care about. Do they have the guts to make the cuts?